This post gives some background on the DLaB approach to STEAM. Over the course of this year the DLaB project sought to cross traditional subject boundaries by exploring the theme of STEM to STEAM, adding the arts to science, technology, engineering and maths. We aimed to build on last year’s theme of technology outdoors by promoting real world exploration and creative problem solving through physical and digital making. Lecturers, teachers and students across four countries, Norway, Denmark, England and Belgium worked together as a community of practice to explore STEAM themes prompted by questions such as ‘What if we could change size?’, ‘What if we moved to space?’ and ‘What if one of our senses changed?’. Our MOOC aims to share our work over the next three weeks and inspire participants to share ideas from their own work on our online community. Part of our project is to introduce innovation and we have thought carefully about ways of working. Our pedagogical approach was based on an interpretation of design thinking (Kimbell, 2015) that begins with empathising, followed by defining a key question, framing a problem and sharing a creative solution. The design thinking model was relevant as we wanted to highlight creativity and innovation alongside the scientific process. What does international collaboration mean in a design thinking model? What does the arts add to the process of scientific enquiry and vice versa? 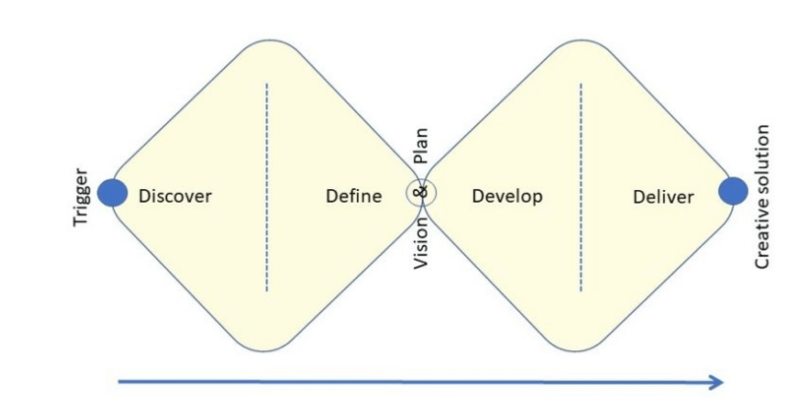 We used a double diamond model to describe divergent and convergent thinking stages that allowed space for the discovery of ideas before homing in on possible solutions. The DLaB project has shown that the arts can enhance different stages of the process. At the beginning of a project it can offer an inspirational impetus by being part of the learning trigger or prompt. Whilst work is ongoing, it can help to make connections between learners, make scientific concepts more accessible, and lend a sense of purpose to an inquiry as learners collaborate in the production of an artistic product. Towards the end of a project it can engage an audience and communicate the results of STEM investigations. STEAM trigger video used to inspire a project at Duston Eldean Primary School. We wanted to take a broad view of the arts, to include genres such as science fiction, poetry, dance and performance, graphic novels, and installations alongside conventional visual arts and music. To this end, we came up with three themes: seeing, hearing and experiencing STEAM, to encompass a broad range of overlapping arts. For example, in the videos below, investigating how Victorian inventions used light to solve problems, children created models using Micro:bits, conductive dough and LEDs. They mentally deconstructed their models and re-represented them as a physical dance performance that was filmed for another group to interpret. An additional aim was to incorporate social and environmental themes where relevant to create meaningful and authentic international exchanges. In this way, the explicit art within STEM connections act as bridges to communicate ideas with others; the arts might be enfolded into any part of the learning event, as a multimodal channel for learning, a catalyst for ideas, or a mediation tool that makes the ideas more accessible to others. For example, an end product might be a data visualisation that draws upon visual literacy skills to interpret scientific findings. The DLaB STEAM work ties in with a growing trend around the world in using STEAM approaches across educational sectors to create a fertile environment for inquiry-based learning, which involves learners in setting learning goals. For example, Connor et al., (2016) in New Zealand, outline five HE engineering student-centric STEAM projects designed to promote active, curious learning; in the US, Radziwill et al. (2015) describe a collaboration on a piece of participatory art between science and technology and arts, and design students; Land (2013) describes a number of STEAM curricula initiatives developed across the US; and Saddiqui and Marcus (2017) suggest that their STEAMpunk Girls Co-Design program can prompt secondary-aged young women to pursue STEM study and careers in Australia. One recurring theme across these projects is the need to mirror the complexity and interconnectedness of work-based STEM professional environments and to prepare students for the challenges of real world problem solving. This often draws upon inductive thinking and requires students to apply knowledge in a practical way. A second recurring theme is a view of uncertainty and failure as positive learning opportunities; it is acceptable for students and teachers to put forward tentative ideas and not to have all the answers. The addition of an A for STEAM, Radziwill et al. (2015) suggest, not only catalyses STEM, but sets the scene for dialogic art that is characterised by interaction within a community. This allows for a move away from the acquisition of knowledge towards non-judgemental inquiry, exploratory questioning and discovery. A similar approach is endorsed by the design thinking process, and in our forays into STEAM this year we have tried to bring together the two strategies. In the context of our international project work, digital art collaborations and exchanges helped to bypass language barriers and build intercultural understandings. This is something we would encourage you to try; even in a local context authentic exchanges between students pursuing similar goals can provide a powerful impetus for learning and making. Connor, A.M., Karmokar, S. and Whittington, C., 2015. From STEM to STEAM: Strategies for enhancing engineering & technology education. International Journal of Engineering Pedagogy (iJEP), 5(2), pp.37-47. Land, M.H., 2013. Full STEAM ahead: The benefits of integrating the arts into STEM. Procedia Computer Science, 20, pp.547-552. Radziwill, N.M., Benton, M.C. and Moellers, C., 2015. From STEM to STEAM: Reframing what it means to learn. The STEAM Journal, 2(1), p.3. Saddiqui, S. and Marcus, M., 2017. STEAMpunk girls co-design: Exploring a more integrated approach to STEM engagement for young women. In 28th Annual Conference of the Australasian Association for Engineering Education (AAEE 2017) (p. 1175). Australasian Association for Engineering Education.